Majlinda Avdiu is 17 years old and she comes from the municipality of Lipjan (a small city of Kosova). She is a student of the 12th grade at the Gymnasium of natural sciences "Ulpiana"-Lipjan. She loves natural sciences, and she works hard to learn it, which is why she’s won many medals in different competitions such as the NASA “Parker Solar Probe.” She is passionate about astronomy, computer science and learning many new languages. Her hobbies include writing and learning new things. Dino Dizdarec was born in Sarajevo 1984. For over 9 years he is employed as an IT professional. He has been dealing with organic farming for the past 14 years. His life goal is to a secure a better life for people with disabilities, and to educate young people about the importance of organic farming. Ivana Dragovic is 21, a 2nd year student of Faculty of Food Technology, Food Safety and Ecology. She is one of the founders of NGO Green Mind, president of the organization, project manager and Igla&Konac upcycling center manager. She does photography both professionally for events like graduation and weddings, and also as a leisure time activity. Her volunteer engagement includes involvement in Red Cross, NGO Zero waste Montenegro and NGO Our Action. Her activities include participation in ''Peace Education Program'' hosted by the Center for Civic Education (CGO), representing Green mind at Green Culture Festival 2018, finalist of the VII Stock Exchange of entrepreneurial ideas organized by the Faculty that she attends, and many more. She is a vegetarian and adores nature, which is one of the reasons for initiating NGO Green mind. She spends her leisure on hiking, walking, cycling, playing, dancing, and yoga. She is creative and has a lot of energy. She loves company, adventures, going out. She sees herself with people who are changing this world! Jasmina Glavinche is a 37 years old who is eco-minded, multidisciplinary designer and is a paper maker. Currently, she is studying sculpture at Academy of Fine Art in Skopje. In 2011 with strong aim to collide the worlds of art, business, and nature, she founded her creative studio, WIZART, which develops, produces, and sells recycled paper, embedded with seeds and jewelry made from wood waste. She is committed to make sound, beneficial choices and positively affect the world. The experience she gained from working with people with disabilities in the past two years inspired her to work on a new social innovation model involving marginalized groups in the production process. Zana Hamza is 22 years old. She was born and raised in Prishtina, Kosovo. She was a student in "Sami Frasheri" high school- mathematics and informatics gymnasium. She is a computer engineer, graduated in University of Prishtina, "Hasan Prishtina". She was a distinguished student and won a scholarship in the first year of studies. She loves technology and programming. She also loves working with children and exploring their potential. Currently, she's a trainer in jCoders Academy, an education center for children age 8-18, with main focus on technology. In her free time, she usually goes hiking and reads books. Rajko Kecman comes from Banja Luka. As a young person, he decided to start a business, with the help of the Mozaik Foundation. His business is Urban Roofs and Greens, where they design, execute and maintain green roofs, green walls and green areas. So far, they have established partnership relations with world leaders and pioneers in numerous areas of modern architecture. Some of the partners are German company ZinCo GmbH, Israeli company Vertical Fieled, Serbian company Gras Garden and others. They believe that through their actions, they will change the future and life of future generations by using smart green cities. They contribute in reducing CO2, increasing the number of green areas, reducing floods in smart green roof systems and much more. Andi Krasniqi is born on November 22, 2001 in Gjakova. He has completed the primary education in the village of Xerxe. He is a student at SHMLP "Selajdin Mullabazi-mici" in Rahovec that focuses on pharmacy studies. He has many passions but the one he would like to mention as outstanding would be the passion for scientific discoveries. Petar Martinovic is 30 years old and he holds a master degree in biology. He is very passionate when it comes to science, especially animals. He used to have several tarantulas as exotic pets and he was also raising food for them which included several insect species. He is unemployed at the moment and his wish is to start food production in a responsible and sustainable way, which for him is the only way! Aleks Tane is currently serving as a board member of the Vjosa Explorer Association. Tane graduated in the Art Academy in Bucharest Romania. Today he is a local development agent in a non-profit organization, managing projects related to sustainable tourism development, and is a certified tourist guide specialized in hiking and rafting. Tane has participated in many national and international fair regarding the promotion of tourist attractions and traditional products of the Përmet district. He is the member of the Slow Food Convivium Përmet and a volunteer for many initiatives undertaken by various actors in environmental protection, youth engagement, and social issues, Tane is a specialist with exceptional communicative, organizational, and managerial skills with a passion for the environment and sustainable development. Marija Mitevska is born and raised in the small town Kriva Palanka located in North-East Macedonia. She earned her bachelor's degree as a professor of Physical Culture and Sport, and currently is finishing her master's degree at the Faculty of Art and Design at the EURM (European University - Republic of Macedonia) in Skopje. Maria's previous job was as a personal trainer in Manhattan, New York. Her love for sports, sport charitable events, and sportswear made her the founder of "Pink Support Mk"- non-profit organization for support of marginalized groups in Macedonia. She started the initiative "Pink Run"- 10k and 5k races for charitable causes. The passion she has for cycling and long-distance running made her the first woman in Macedonia who ran and biked across Macedonia and made a sports documentary called "Stay Different (run-bike-repeat)." Ensar Perco was born in Tešanj, Bosnia & Herzegovina on 14th of January, 1996. Currently, he is working as an international consultant in agriculture commodity sector for Australian manufacturing and trading company. Milan Petrović is a father, and entrepreneur and a language teacher, but he is always striving to push his limits even further. He is interested in non-formal education and he is the founder of a co-learning hub Unbox as well as the author of several innovative projects in the field. According to him, modeling and 3D printing is a chance to get motivated to recycle and care about the environment in a modern, proactive, whereby being thrilled to be one of the first to start this great eco revolution in the region. Pezana Rexha has studied architecture at The Polytechnic University of Tirana and graduated in January 2010. She has been working since she was 14 and has created her first enterprise when she was 18 years old. In April 2013, Pezana took part in the competition for social enterprises, “Green Ideas”, which gave her the possibility to create an innovative enterprise, “Pana,” that nowadays, has quite a huge success in the market. Pana is a social enterprise that produces unique design furniture and accessories by upcycling reclaimed wood, old pallets and old wood furniture. Pana’s employees are people from marginalized groups (orphans, retired, Roma and Egyptian community and people with special needs) aiming to give them the possibility to have a profession and a decent life. According to Pezana, small countries like Albania provide the possibility to create a social enterprise, something innovative, and most importantly at the same time protecting the nature. Darko Savljic was born on St. Valentines in 1974 in Podgorica. An ornithologist by profession, he is the founder and during a long period, director of the Society for animal protection Podgorica - the strongest green NGO in the country. He has built the first asylum for cats and dogs in Montenegro. He has been a guide and mountaineer of the Mountaineering society Komovi which this year celebrates 40 years since founding. He works for the betterment of lives of animals, especially birds in Montenegro. Darko has published more than 90 scientific papers, mostly abroad. Aleksandar Scepanovic is an entrepreneur from Belgrade. Along with his brother Ninoslav, in 2009, he designed and built the log-hostel Montana on Kopaonik Mountain in southern Serbia. Over the past 9 years they have hosted hundreds of guests from all continents and today "Montana" is the best rated Kopaonik accommodation on all relevant web sites, and it's included in Lonely Planet's guide for South East Europe as a recommended accommodation. Along with the expansion of Montana's capacity, Aleksandar, with his two associates, works on a new entrepreneurial project called Zanateria. Zanateria aims to gather all small producers of food, beverages, clothes, footwear, cosmetics, furniture, souvenirs, and jewelry and create an important alternative online store while also creating some kind of "craft syndicate" that will encourage networking and education of the entire craft scene in Serbia. Albi Sulo is an environmental specialist and an environmental researcher graduated in Bachelor and Master Degree with maximal grades in Guglielmo Marconi University, Rome. Last years as a personal experience, he has studied through several environmental organizations and did different researches about international studies of the phyto-climatic areas, concerning plants, their areas and habitats. Mostly, these researches and experiments are made with cactus succulents (such as Aloes) by experimenting with their climatic adaptation, soil typology, pH level or water requirements, soil analysis before and after planting, crossing different varieties, etc. Except schooling and his researches, Albi Sulo was also the Albanian National Tennis Champion and besides being a professional tennis player, he is also known for a great contribution to the design of various projects for the Albanian Tennis Federation funded by the International Tennis Federation. Kristina Todorova is 20 years old. Currently she studies at the Ss. Cyril and Methodius University in Skopje at the "Faculty of Agricultural Sciences and Food". Kristina is a project coordinator at the Civil Society Organization "Ekovita" from the city of Negotino located in Central Macedonia. She has been involved in several projects and recently she took part at Training for Organic Production where she developed the idea for making the "gadjun"- a wonderful product made from Grape Malt Syrup and Reishi Mushrooms. Kristina also works with the production of mushrooms and together with the Ekovita team, delivers various trainings. Vesna Bajšanski-Agić is the Executive Director of Mozaik Foundation. She joined Mozaik in 2008, as Mozaik begun its transformation into a social enterprise. 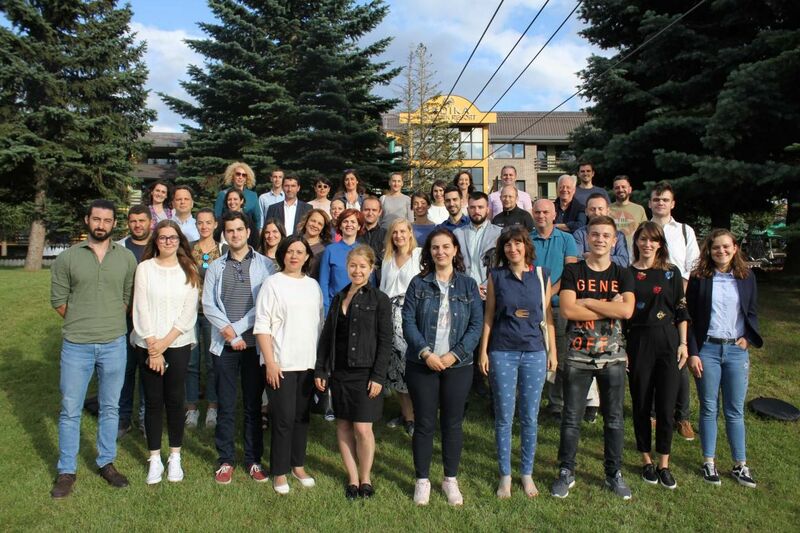 Today, Mozaik Foundation is the leading social enterprise in the Western Balkans, engaged in programs relevant to youth social entrepreneurship and social innovation. She is a Governing Board member of two social businesses that support the disadvantaged and promote reconciliation in an economically sustainable way, and a Board member/president of two national NGOs. Prior to joining Mozaik, Vesna worked for ten years in various management positions in other national NGOs focused on social justice and she is an internationally certified trainer for Education for Social Justice. She is a member of several national and international groups and networks, including Governing Council member of the EFC, Steering Committee chairperson of GEF, SIGN Network, ISSA. She has a degree in Economics from the University of Sarajevo. Vesna is a 2012 recipient of the European Marshall Memorial Fellowship awarded by the German Marshall Fund of the United States. Dajana Berisha is the Executive Director of the Forum for Civic Initiatives. Dajana joined the forum in February 2013 to manage the development and direction of the Forum including design objectives, strategies and activities. Her previous professional experiences include policy-making in areas such as employment, social affairs and migration in order to support active employment policies combined with economic assistance for poverty alleviation. In this capacity, Dajana has served as the institutional representative on a number of European events, international institutions, or in bilateral meetings between governmental institutions of the Western Balkan countries. Dajana has extensive knowledge and experience regarding the professional development policy and regional cooperation in the Western Balkans, which combined with the ability to understand cultures and geopolitics of the region, provides premises for efficient leadership. Dajana graduated in the field of linguistics and literature, holds an MA in International Migration Policies and Development from the University of Sussex, and was educated in Albania, Great Britain, Denmark and Sweden. Dorina Bita is a Project Finance Officer at Partners Albania for Change and Development. She is responsible for the Green Ideas management and financial management of “EMBRACE- Entrepreneurship Models Building Relations and Creative Economy” implemented by Partners Albania and funded by European Union. She is an accredited holder of a degree with Accounts as specialization from the Tirana University, Economic Faculty and another recent one (Professional Master) in Public Administration from the same institution. 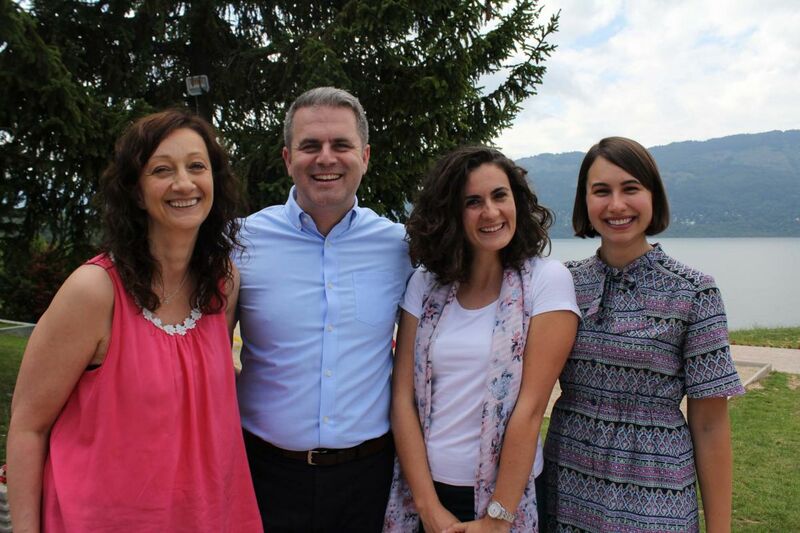 She is part of Partners Albania team after over 12-years of experience working with two other Albanian’s NGO. She is a trainer for different managerial aspects and also a First Aid provider. Anica-Maja Boljevic has been the Executive Director of the Fund for Active Citizenship (fAKT) since its foundation in 2008. She served as the Head of Catholic Relief Services (CRS) program in Montenegro from November 2002 to October 2005, after she had managed CRS youth advocacy and leadership program for two years. Before joining CRS, Maja was an English high school teacher for eight years. Her professional background and experience have been strongly linked to education and civil society programs, with an emphasis on supporting and fostering civic participation to encourage proactive problem solving and responsive governance. She is a member of the national Council for NGO Development and serves on several boards of Montenegrin non-profit organizations. Biljana Dakic Djordjevic is the Executive Director of Trag Foundation, an indigenous non-profit foundation supporting local communities and grassroots activism in Serbia. Trag Foundation encourages citizens’ engagement and promotes local philanthropy. Biljana has nineteen years of professional experience in the non-profit sector, with extensive knowledge on fundraising and partnerships development, strategic planning, program management, and cross-sector cooperation. From 2012-2014, she managed a regional grant-making program with the Balkan Trust for Democracy (BTD), a project of the German Marshall Fund of the United States. As the Development Director of the Belgrade Fund for Political Excellence from 2004-2012, she supported capacity building of political and public leaders in Serbia and the Balkans. Biljana is a board member of the UN Global Compact in Serbia, Serbian Philanthropy Forum and DobroCiniTi philanthropic initiative. She is Deputy Chair of the Council for Corporate Social Responsibility affiliated with the Serbian Chamber of Commerce. Nadja Dragovic is a program manager in Fund for Active Citizenship –fAKT with more than ten years of engagement. Her professional background and experience is diverse – working in the media, teaching English as high school teacher and volunteering for the SOS helpline for women and children victims of violence, with focus on women and children’s empowerment. Working with and for the youth, is her field of interest. She earned numerous certifications relevant for civil society organization’s development. Nadja holds a B.A. in English Language Teaching, Faculty of Philology. The quote that describes her the most” What I am worth is what I do for other people”. Juliana Hoxha started Partners Albania as an independent organization in 2001. She brings a 16-year long experience in developmental issues, advocacy campaign, training and consultancy at national and regional level. Her experience includes a long and successful working relation with ODA donors, international and local organizations in Albania. She has a rich experience in project design, development and management, training curricula development and delivery, proposal writing and cross sector relations. She has significant experience in program evaluation and assessment design and administration, and extensive involvement in grants program design and management and especially umbrella grants for local organizations. Further, Juliana has strong professional relationships with the non-for-profit, local government, donor community and relevant government institutions. She has eleven years of experience in managing three USAID cooperative agreements, training and grant programs. Željko Pauković is a pioneer of NGO development in Bosnia and Herzegovina with 20 years of experience in several organizations, with particular professional focus in creating sustainable programs for youth leadership, organization and community development. He is one of the founders and the Executive Director for ten years of Youth Communication Centre, one of the largest and the most respective youth NGO in Bosnia and Herzegovina. Over the last nine years he serves as a Program Manager and Program Director of Youth Bank Program, at MOZAIK Foundation, responsible for the overall development and implementation of the program in Bosnia and Herzegovina and region. He provides technical advice/capacity building in youth outreach, social innovation and development, and facilitating cross-sector partnership. Further, Željko provides leadership support in securing partnership with governments, businesses, and other stakeholders. He completed postgraduate master’s degrees in Economics (Human Resource Management). Kushtrim Puka is the Programs Manager at FIQ. He leads two of the three main programs at FIQ: that of Philanthropy and Sustainable Development. He has a vast experience in the private and public sector, working with leading companies and organizations such as ELKOS Group, Institute for Advanced Studies and Ipko Telecommunications LLC. As an entrepreneur, Kushtrim has established Globex International and works as an adviser for a number of small businesses in Kosovo. He is also a board member of EcoEnergy (Finland), and a faculty member at ERSTE NGO Academy (Austria). Kushtrim completed his studies at the Rochester Institute of Technology, with the main focus on Entrepreneurship and Business Administration and a second major on Public Policy. Ivana Markovic is the grant program manager at Trag Foundation. She has been with Trag since 2005 and currently leads grant program team. Since 2008 Ivana has been responsible for development and management of all grant programs in Trag, including management of decision making process. She has an excellent knowledge of civil sector in Serbia and significant experience in grant making based on bottom-up approach. Ivana has graduated from Landscape Architecture and she is certified by Project for Public Spaces (USA) as a Place-making consultant for Serbia. Maja Anteska has over 20 years’ experience in SME development throughout Western Balkan and Europe including 18 years working for a range of high profile international organizations amongst them European Bank for Reconstruction and Development, UK Department for International Development, European Union, World Bank and South East Europe Development Programme. She also served for six years as Principal Manager for EBRD SME Finance&Development Group Macedonia. She is a National Team Leader of the ‘Women in Business’ programme, sponsored by EBRD, Sweden and Luxembourg. Maja is a Senior Member of the Western Balkan Social Entrepreneurship initiative supported by Rockefeller Brothers Fund and a Supervisory Board Member of a foreign bank in Macedonia. Visar Azemi is the executive director at the Balkan Green Foundation and coordinator of the Kosovo Civil Society Consortium for Sustainable Development. Previously, Visar served as the representative and lecturer for the University of Maryland University College (UMUC) in Camp Bondsteel, Kosovo. He has over ten years of professional experience in non-profit sector, with extensive knowledge in partnership development, strategic planning, program management, and marketing. His prior work also includes management work with the Central Texas College, International Organization for Migration, and KBR. Visar holds a graduate degree in electrical engineering from the University of Pristina, a second Bachelor’s degree in Management Studies, and a Master’s degree in International Financial Management from University of Maryland University College. Rinora Gojani is the program manager at the Balkan Green Foundation. Rinora specialized in European Union politics and policy and has a special interest in the energy sector, sustainable development, and activism in the Western Balkans. Previously, Rinora worked as a Senior Research/Policy Analyst for sustainable development issues at the Institute for Development Policy, where she also liaised with global environmental and sustainable development policy organizations. Additionally, she worked at the Ministry of European Integration where she cooperated intensively with the Ministry of Energy and Mining on providing inputs to the European Commission Progress Report. Rinora has been active in various civil society organizations, such as Integra NGO, where she coordinated ‘Our Future European Integration’ project, an exchange program which brought together young people from Kosovo, Serbia, and the Netherlands and Youth Initiative for Human Rights, where she mobilized volunteers, organized street actions and monitored implementation of laws. Rinora has extensive experience in fundraising and organizing campaigns, with a focus on social, environmental, and development issues. Karen Karnicki is the program assistant for the Rockefeller Brothers Fund’s Peacebuilding and Western Balkans programs. Prior to joining the RBF, Karen was an intern at UN Women, where she conducted research on gender mainstreaming within the UN system. In 2014, she joined the inaugural team at Rhize, a start-up nonprofit that seeks to build the capacity of grassroots social movements around the world. As a fellow at Rhize, she helped grow the organization by fundraising, managing research projects, developing training materials, and assisting with program design and implementation. Karen also worked as an ESOL teacher in Prague, Czech Republic and as an assistant for the Islamic Civilization & Societies program at Boston College. She holds a Master of Arts in human rights studies with a concentration in gender and transitional justice from Columbia University, as well as a B.A. from Boston College, where she studied Slavic studies and Islamic civilization & societies. Mia Vukojević is the Program Director for the RBF’s Western Balkans Program. Ms. Vukojević brings exceptional experience working with civil society, international organizations, governments, and grant making institutions in the Western Balkans and beyond. She most recently served as a program officer for the Oak Foundation’s Issues Affecting Women Programme in Geneva, Switzerland. Her program development and grant making expertise includes strategies for building accountability and citizen participation, strengthening organizational capacity, and supporting the leadership, knowledge, networks, and engagement needed to advance movements for system change. Prior to her tenure at the Oak Foundation, Ms. Vukojević worked with the Organization for Security and Cooperation in Europe as a monitoring and reporting officer for the Special Monitoring Mission to Ukraine, served as executive director of the Trag Foundation in Serbia, and managed humanitarian emergency response programs for Oxfam Canada and Oxfam Great Britain. Ms. Vukojević holds an MA from Carleton University’s Institute of European and Russian Studies, Faculty of Public Administration and Management in Ottawa.